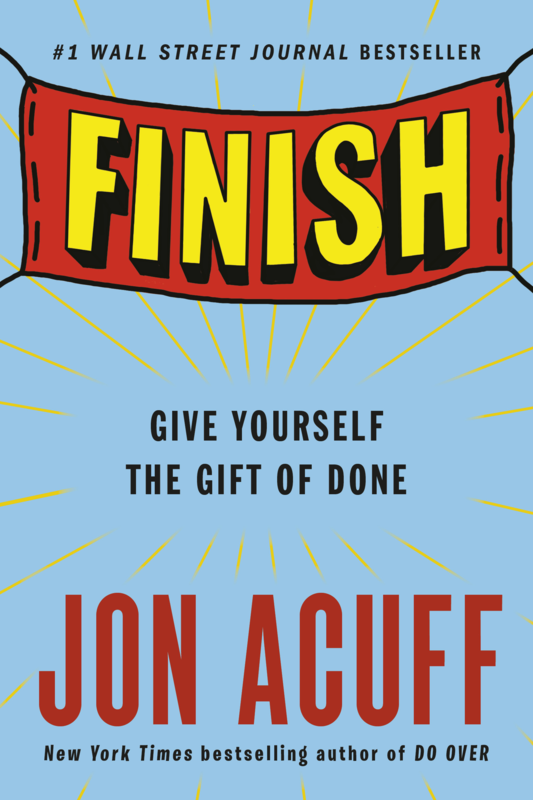 From New York Times bestselling author Jon Acuff, the perfect book for anyone who starts a million projects but rarely makes it to the finish line. #1 Wall Street Journal bestseller! Jon Acuff, New York Times best-selling author of Do Over, Quitter, and Start, offers strategies for anyone who's ever wondered, "Why can't I finish what I started?" According to studies, 92 percent of New Yearâ€™s resolutions fail. Youâ€™ve practically got a better shot at getting into Juilliard to become a ballerina than you do at finishing your goals. For years, I thought my problem was that I didnâ€™t try hard enough. So I started getting up earlier. I drank enough energy drinks to kill a horse. I hired a life coach and ate more superfoods. Nothing worked, although I did develop a pretty nice eyelid tremor from all the caffeine. It was like my eye was waving at you, very, very quickly. Then, while leading a thirty-day online course to help people work on their goals, I learned something surprising: The most effective exercises were not those that pushed people to work harder. The ones that got people to the finish line did just the oppositeâ€” they took the pressure off. Why? Because the sneakiest obstacle to meeting your goals is not laziness, but perfectionism. Weâ€™re our own worst critics, and if it looks like weâ€™re not going to do something right, we prefer not to do it at all. Thatâ€™s why weâ€™re most likely to quit on day two, â€œthe day after perfectâ€â€”when our results almost always underperÂ­form our aspirations. The strategies in this book are counterintuitive and might feel like cheating. But theyâ€™re based on studies conducted by a university researcher with hundreds of participants. You might not guess that having more fun, eliminating your secret rules, and choosing something to bomb intentionally works. But the data says otherwise. People who have fun are 43 percent more successful! Imagine if your diet, guitar playing, or small business was 43 percent more sucÂ­cessful just by following a few simple principles. If youâ€™re tired of being a chronic starter and want to become a consistent finisher, you have two options: You can continue to beat yourself up and try harder, since this time that will work. Or you can give yourself the gift of done. ON ACUFF is a consultant, blogger, public speaker, social media whiz, and the author of Stuff Christians Like, The New York Times bestseller Start, and The Wall Street Journalbestseller Quitter. He has sixteen years of branding and marketing experience with companies such as The Home Depot, Chick-fil-A, Bose, and Staples. He lives in Nashville, Tennessee.